Please add to this site by using our feedback form when you visit! If you know of any LINKS not included in our database, leave them and you could WIN! If you know of a good link for racing, motoring, race tracks, or even other fun things to do when at a track, just leave the web address using our feedback form and you will be entered in the RfW contest to win a T-Shirt or even a Sony Playstation! This site is a FREE service. The content is provided by the suggestions and the hard work of thousands of "Racing for" members around the world and race fans like you. 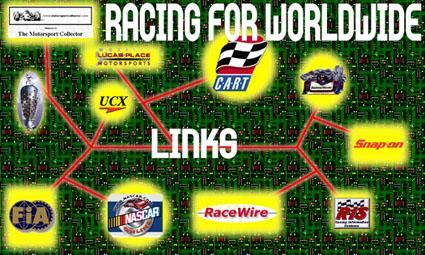 This site is maintained by race fans and A Graphic Solution, Inc.